Optionally, see my last two posts for background: one, two. Here's a doodle seeking to portray a distinction. Frames are discrete and identifiable components of our space and experience. In contrast, crazy life is beyond description! The distinction is between complex, crazy life, which is unpredictable, organic, emotional and contradictory, versus the discrete components we can identify and manipulate in our environment. My little 'frames theory' seeks to identify what we can and can't manipulate in our school environment - or any environment. Fundamentally, I believe the problem with schooling is the attempt to control complex, crazy life. The factory frames of industrial schooling act as if human beings are products that can be operated on via a standardised set of frames. These frames restrict space for 'crazy life', agency and initiative. 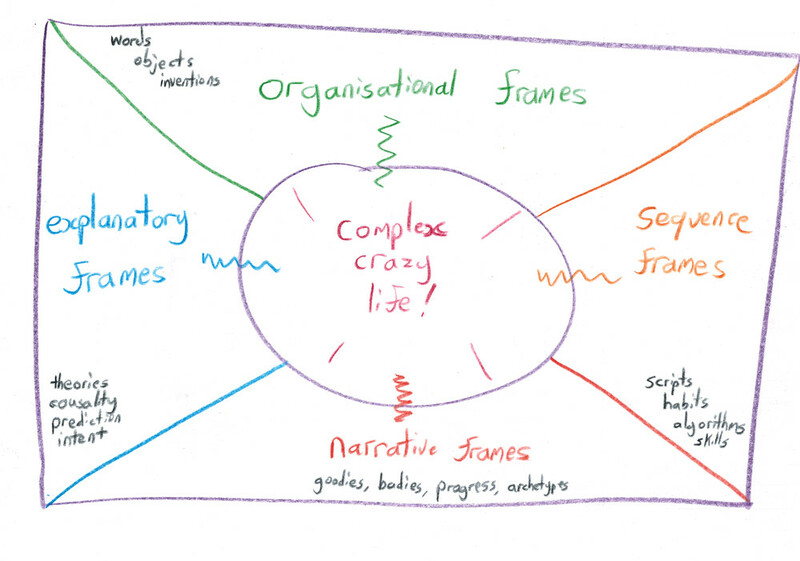 In contrast I believe in broadening out the space for 'crazy life' and I am pioneering frames theory as a way of putting language around that. For instance, in this video below there is a great deal of space of unpredictable and complex interactions by real breathing agents called human beings. Yet there are frames... some visible, some invisible. but the art form is deliberately designing physical, virtual, and cultural spaces to encourage self-actualisation in all of its glorious and subversive unpredictability.